Stuffed peppers are great (and easy) to make for a family meal or casual get-together. 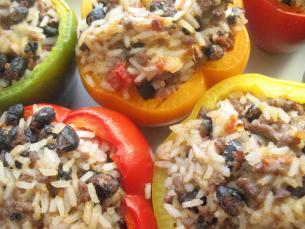 My filling for stuffed pepper starts with two simple ingredients – cooked rice and browned ground beef. You can use leftover cooked rice (from Chinese take-out?) or make your own. 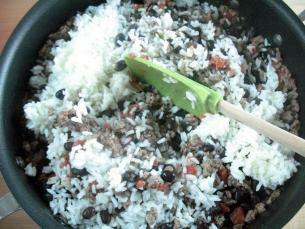 Get the rice started first as it usually takes about 20 minutes to cook. Check out my video on “How to Cook White Rice” for a quick review. 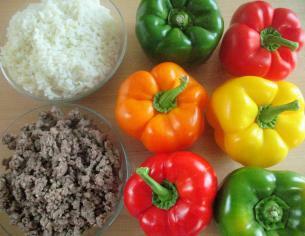 While the rice is cooking, get the peppers washed and remove the stem and seeds. 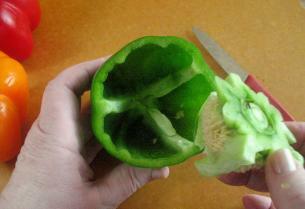 Any color bell pepper will do. But remember, the red ones are the sweetest! Start by slicing off the very top of the peppers. 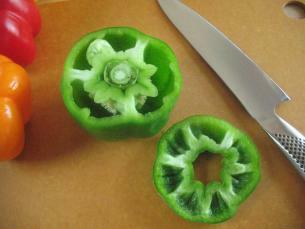 Then,with a small paring knife, carefully slide the knife around the stem to loosen it. You should then be able to gently pull the stem out. 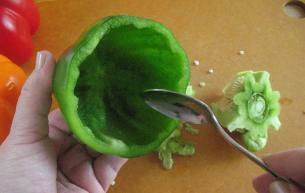 With a spoon scrape out any remaining seeds and “stem ribs”. It is important that the bell peppers are able to balance upright on their own. 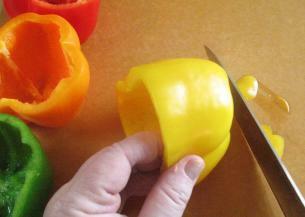 Slice off the tiniest bit off the bottom so that the peppers can stand without rolling over. Set the cleaned peppers snugly in a baking dish and set this dish aside for just a moment. 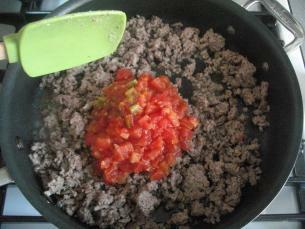 In a large frying pan, over medium-high heat, brown the ground beef and drain off any excess fat. For a quick review, check out my video on “How to Brown Beef”. …which are diced tomatoes with green chilies. Using a colander, drain one can of black beans in the sink, rinse, and drain again, and add them to the frying pan as well. Mix everything together and simmer for about 5 minutes. At this point you could add 1/2 teaspoon of onion powder and 1/2 teaspoon of garlic powder if you wish. With a spoon, fill the peppers with the filling. They should fit snugly in the baking dish! 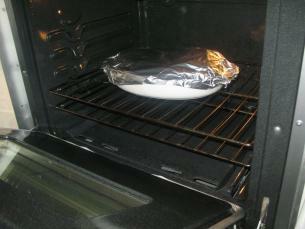 Cover the baking dish with tin foil and put them in a 375 F. degree preheated oven. …and continue cooking for another 10-15 minutes until tops are slightly browned and pepper skin can be pierced easily with a fork. 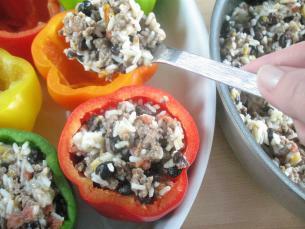 I served these beautiful stuffed peppers with butternut squash and they were fantastic! Nice! I love stuffed peppers. I never thought to put cheese in the stuffing mix, though. That’s a great idea. I’ll have to do that next time I make them. The cheese keeps the filling nice and moist. For real cheese lovers, once the tin foil is removed, you can add even a bit more shredded cheese to the top of the peppers. That extra 10-15 minutes of cooking will melt the cheese perfectly. love your site and videos. please make of video of this. i love the combination! I love peppers and their different colors. Its very nice, i will surely try this dish. You have a cool site! I will add it to the ever growing list of video requests! This recipe has lots of different parts to it. 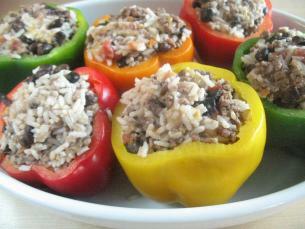 I have found if you cook the rice the day before it feels like a real time saver when preparing these stuffed peppers. Pity I do not speak Japanese! I can not understand a single word on your site! I’m wondering about freezing? I like to cook double and freeze for later. I’m guessing wrap and freeze before baking? I would first blanch the peppers, in boiling salted water, for about 2-3 minutes each and dry them completely. 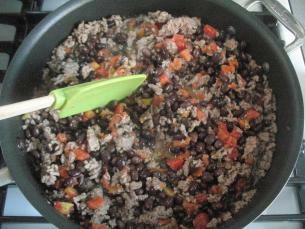 Make the filling and then fill the blanched peppers. 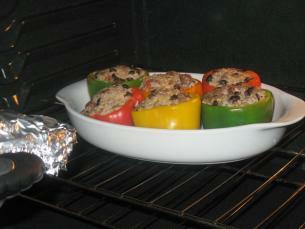 If possible, let the filled peppers thaw overnight in the refrigerator and then bake according to the direction above. Good Luck! And be sure to let me know how it all turns out! These would be fantastic for a dinner party as they look so pretty! 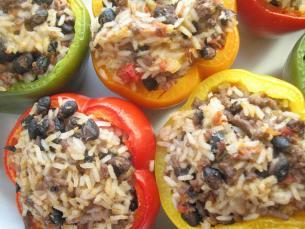 These Stuffed Peppers really get the “WOW” reaction when brought to the table! AND they actually re-heat beautifully in the microwave! 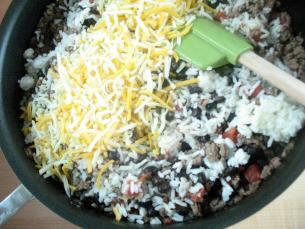 Adding the cheese to the meat mixture is such a simple step for keeping the mixture together. I used to sprinkle it on top, but will try this idea. 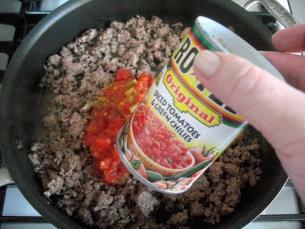 Try substituting a jar of salsa for the tomatoes, adds lots of flavor! Nice site even if you’re not a beginner, it gives me ideas for old favorites. The salsa idea is great! Kathy already had the Rotel substitute going for tomatoes, which adds some chilies to the mix, but salsa would kick it up another notch or two, what with the onions and spices. There a so many really great salsas available at the grocery store! It is a very versatile ingredient to have on hand in your food cupboard. I’ve used it as a topping for baked fish, on top of a baked potato and of course with corn chips! A can of diced tomatoes and a small can of jalapeños would work beautifully in this recipe, BUT it is easier to just buy one of diced tomatoes with the chilies already in it! Onions and garlic would also be a GREAT addition to this recipe! I love your filling recipe, am going to try it in a traditional eggroll wrapper as I look for new fillings to put in them and this one sounds fantastic. 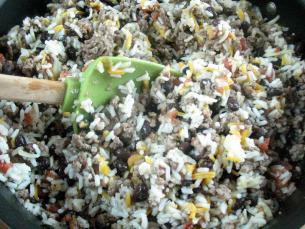 I love the mixed colors of the peppers, nice touch w/ black beans added for FIBER, never knew to put that in its a good filler. 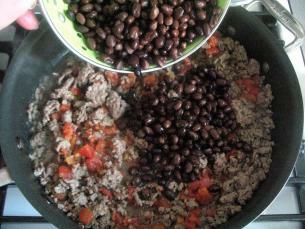 The black beans really do stretch this recipe! These stuffed peppers reheat beautifully in the microwave.